Chiu LC1, Zhu W, Ooi VE. Herpes simplex viruses (HSV) are pathogenic. With the emergence of drug-resistant strains of HSV, new antiviral agents, especially those with different modes of action, are urgently needed. 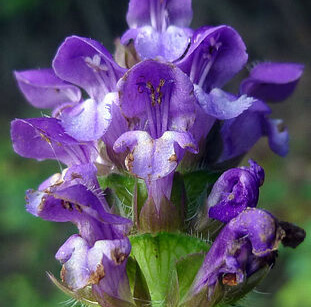 Prunella vulgaris L. (Labiatae), a perennial plant commonly found in China and Europe, has long been used as a folk medicine to cure ailments. In this study, a polysaccharide fraction was prepared from Prunella vulgaris (PPV), and its effects on the expressions of HSV-1 and HSV-2 antigens in their host Vero cells were investigated with flow cytometry. The HSV antigen increased time-dependently in the infected cells, and PPV reduced its expression. The effective concentrations of PPV with 50% reductions of the HSV-1 and HSV-2 antigens were 20.6 and 20.1 microg/ml, respectively. The novelty of PPV is that it also reduces the antigen expression of acyclovir-resistant strain of HSV-1. After incubations with 25-100 microg/ml of PPV the HSV antigen-positive cells were reduced by 24.8-92.6%, respectively, showing that this polysaccharide fraction has a different mode of anti-HSV action from acyclovir. Results from this study show that PPV is effective against both the HSV-1 and HSV-2 infections, and flow cytometry offers a quantitative and highly reproducible anti-HSV drug-susceptibility assay.